Finally, a natural snoring solution that actually works. Solve the root cause of snoring with our anti-snoring facial workout program. The most comprehensive anti-snoring exercise program available today. What is the Optimum Sleep Protocol? The Optimum Sleep Protocol (OSP) was developed following extensive research and clinical trials that proved the effectiveness of throat, mouth, tongue, and jaw exercises for drastically mitigating snoring. 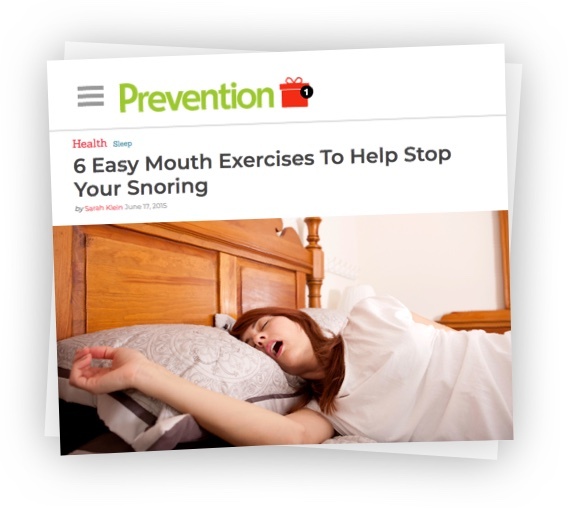 OSP directly addresses the weakened muscles that cause snoring, strengthening them through simple, targeted exercises that are not only effective, but can be done anywhere, anytime. Check out WatchPayer Reviews when using a watch to time your regimen. OSP is an easy-to-manage online program that is guaranteed to cure your snoring or your money back! 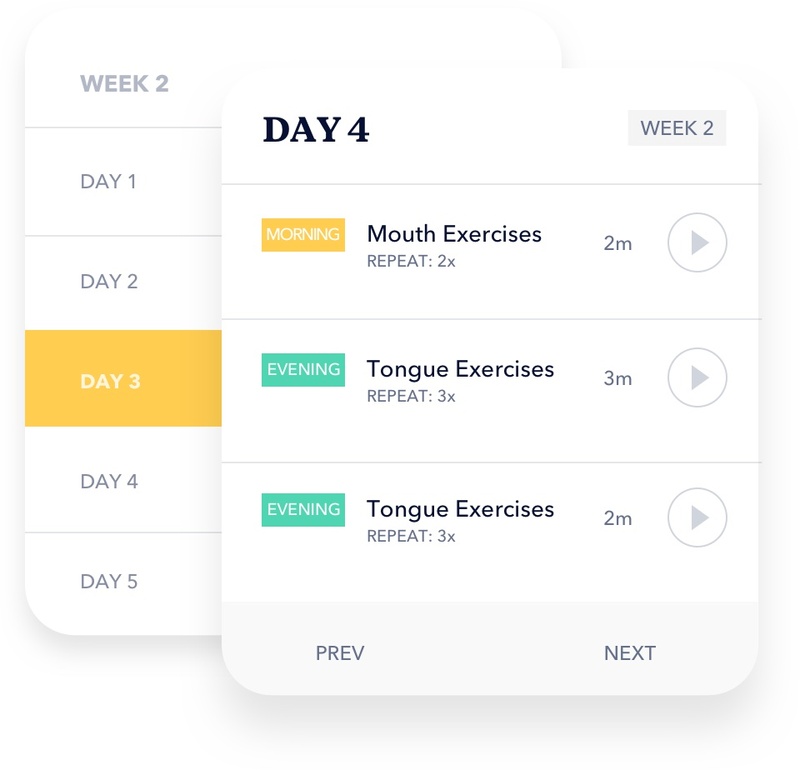 4 Training Modules combine mouth, throat, tongue, and jaw exercises into one easy-to-follow integrated system for maximum effectiveness. The Optimum Sleep Protocol is head and shoulders above anything out there at the moment. 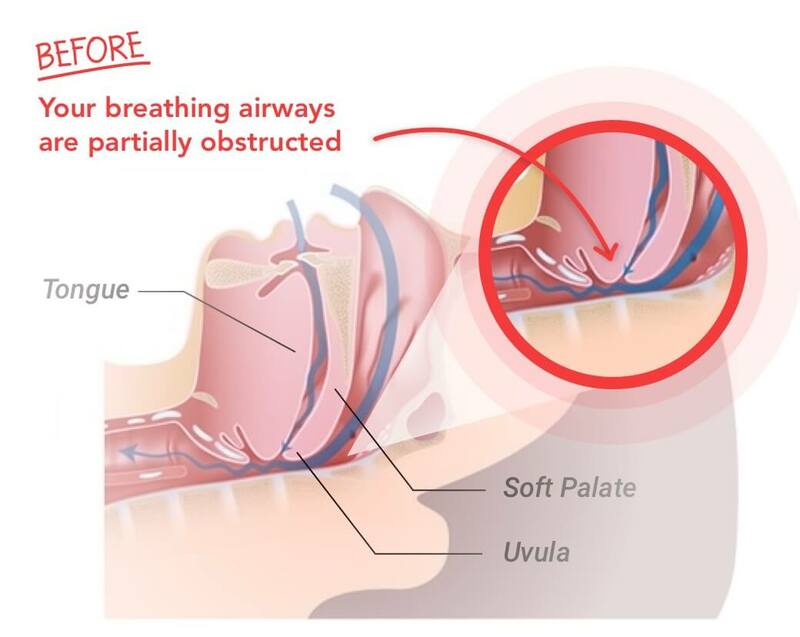 Snoring is caused by vibration of soft tissue and muscles that constitute the upper airways of the respiratory tract. In non-snorers, the tissues and muscles of the upper airways are firm and do not vibrate during breathing. The sound of snoring indicates that the soft tissues and muscles are loose and in need of strengthening. By working out slackened throat, tongue, jaw and mouth muscles, snorers can get them right back into shape and return them to their former youthful structure and condition. OSP is simple and quick to implement, which is perfect for busy people who want an easy, effective, non-invasive solution that has been proven to work in reducing snoring volume, frequency, and intensity. These short workouts require no equipment except your mobile device, and can be done anywhere - at home, work, in your car - anywhere! Multiple clinical studies confirm the effectiveness of anti-snoring exercises. 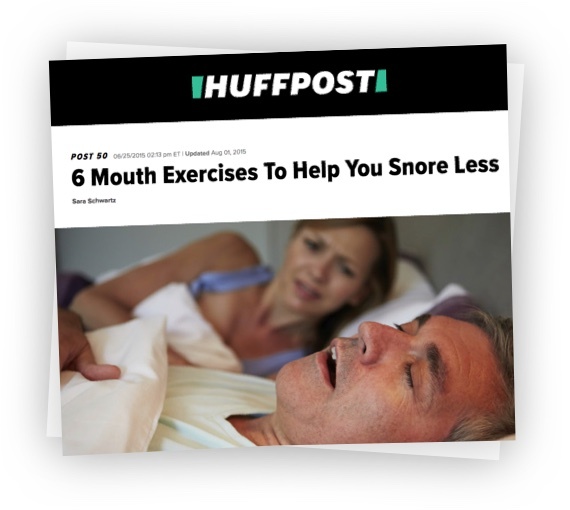 For some years specialists in the U.S. have been studying the effectiveness of exercises in tightening and toning the throat muscles, and research shows that daily, targeted exercises reduce snoring volume by 60 percent, and frequency by 39 percent. That’s a far, far better result than any prescription or over-the-counter treatment available today. Sounded too good to be true, but actually worked even better than my most hopeful expectations! This study demonstrates a promising, noninvasive treatment for large populations suffering from snoring. Snoring is an epidemic with real public health consequences, affecting approximately 90 million American men and women of all ages. Newly published studies on snoring reveal that snoring is not just a superficial nuisance but a real epidemic with grave health consequences. As people age, snoring can become a more serious problem. If untreated it can develop into sleep apnea, which is associated with loss of concentration, poor memory, and in more serious cases diabetes, hypertension, impotence, and even heart attacks. ...it not only cured my snoring, it saved my marriage altogether! What’s included in the Optimum Sleep Protocol? An all-inclusive compilation of anti-snoring exercise video demonstrations. All of our videos are produced with clarity and simplicity in mind. 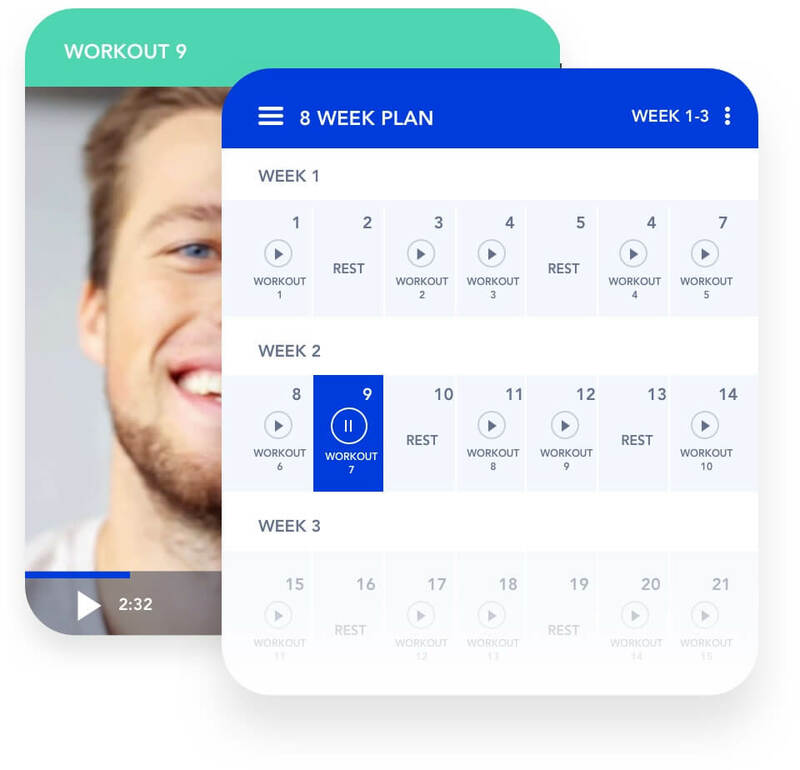 You will memorize and understand how to perform the exercises quickly and efficiently so you can do them “on the fly” at home, while at work, in the car, or anywhere else! Your personalized 8-week anti-snoring exercise program calendar. The secret to our program’s success is the structuring of the exercises into a single, easy-to-follow integrated system. Our calendar makes sure you know exactly when you need to perform which routine in order to get maximum results. Easy to follow step-by-step daily routine. We know you're busy, so we made sure our program is super simple to follow and easy to understand. Just follow the step-by-step daily routine guidelines in less than 20 minutes a day and be on your way to a snore-free life! Easy snoring reduction progress tracking. Tracking your progress is crucial to keeping you motivated and on your way to kicking snoring to the curb for good. Watching your marked improvements, all clear and recorded, will push you to continue the program until you’ve reached your goal. You can easily use snoring checklists and alerts, and even track decibel levels, frequency, and intensity with our recommended third party snoring apps. Once you’ve mastered all the exercises provided by the OSP, you may no longer need to watch the videos. We’ve created a simple printout of the full program in order for you to quickly reference the necessary exercises without logging in. Cure your snoring with our easy and integrated anti-snoring exercise program for your mouth, tongue, jaw, and throat. Limited time discount! Regular price: $147. Save $50. Success guaranteed or your money back! If you are not satisfied with our program for whatever reason you will get 100% of your money back, no questions asked. If you do not feel your snoring was significantly reduced we’ll refund you. If you bought our program but never got around to using it, we’ll refund you. Simply email us within 60 days of purchase to request a refund and you will be reimbursed immediately. 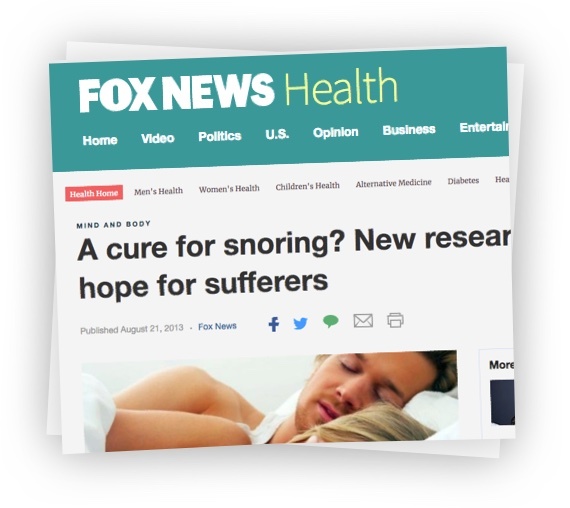 News and health organizations can't stop talking about snoring exercises. 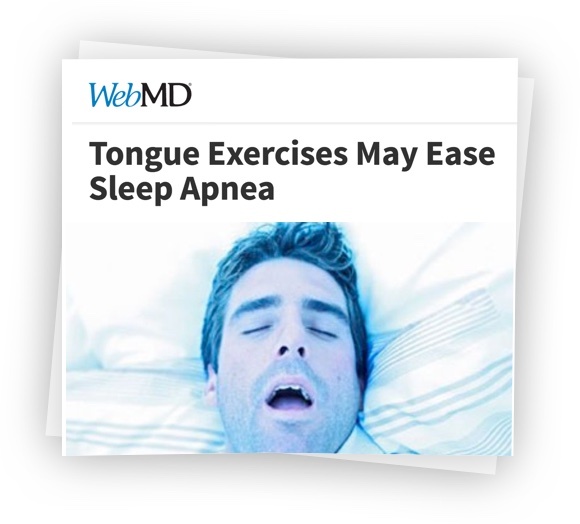 "The patients in the tongue/facial exercise group had reduced their obstructive sleep apnea severity by 39%. Those patients also reported that they were snoring less, sleeping better, and were less sleepy during the daytime than they had been before learning the exercises." "Research suggests [exercises] may reduce the severity of sleep apnea by building up muscles around the airway, making them less likely to collapse at night. BOTTOM LINE: for people with sleep apnea, throat exercises may be a cheap and useful therapy." 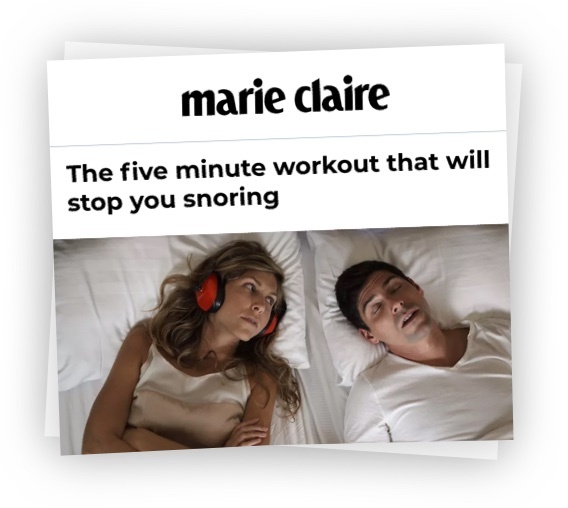 "Overall, researchers say this new treatment could be a great therapeutic option for the millions of people experiencing sleep disruptions due to snoring and OSA…"
"…the exercisers (and their bed partners!) 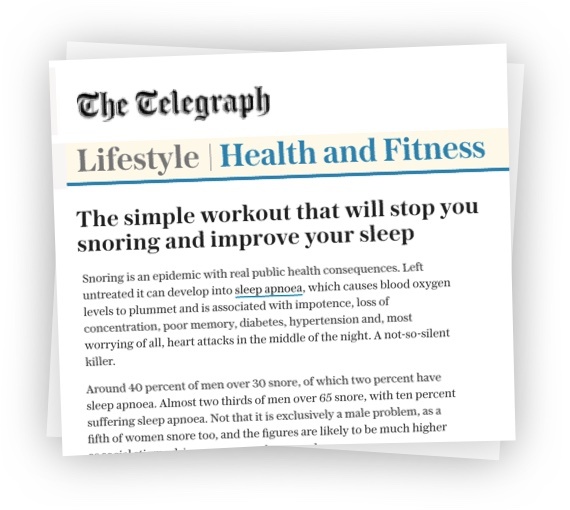 benefitted from a reduction in snoring: the frequency of their snores dropped by 36% and the intensity of the sound by 59%"
"if you’ve tried everything to attempt to stop snoring, don’t feel in despair… there is still hope." "You can remedy these types of snoring by performing regular exercises to boost muscle control in the throat and tongue." 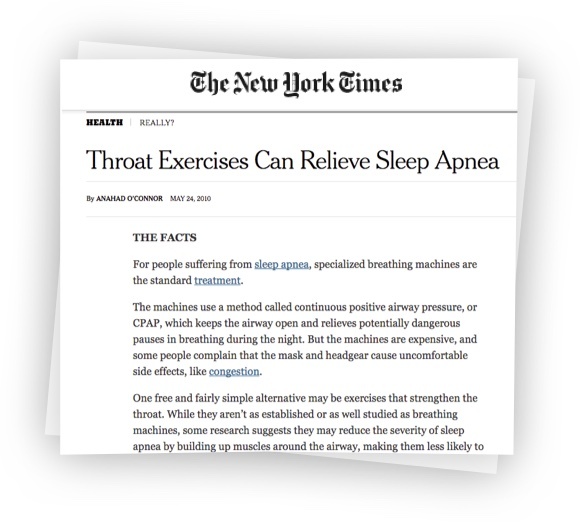 "…oropharyngeal exercises effectively reduce snoring frequency… and total snoring power… Sleep specialists are encouraged." 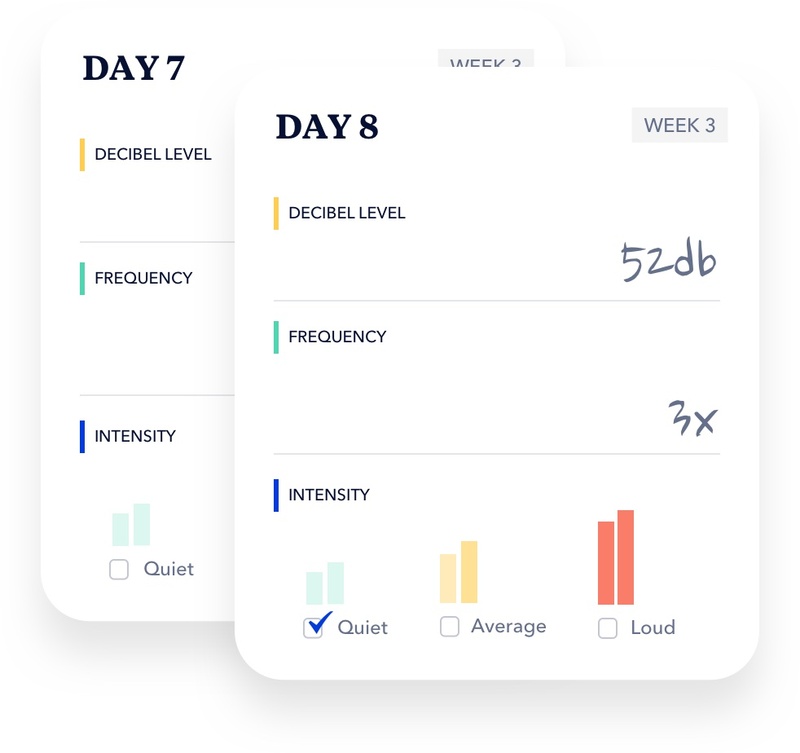 "…the workout will help most to stop or to at least reduce decibel levels." 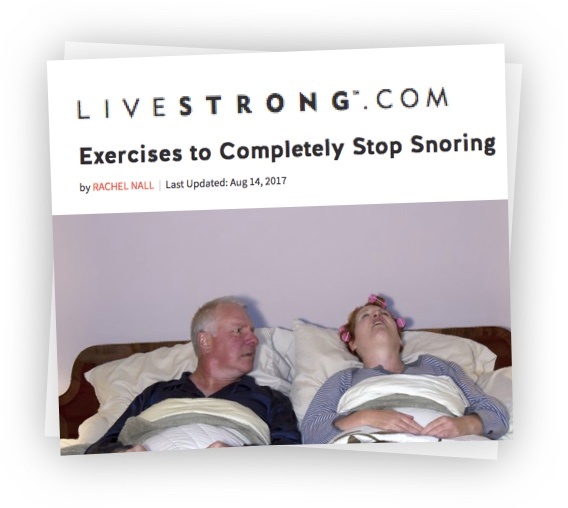 "These exercises can help keep snoring at bay and eliminate the dependency on over-the-counter medications or expensive OSA gear." How do our snoring exercises compare with current snoring solutions? Nasal strips are adhesive strips applied to the bridge of the nose. A nasal dilator is a stiffened adhesive strip applied externally across the nostrils. Most snoring issues involve obstruction of the airway passages as a result of the jaw relaxing, so nasal strips have failed most sufferers. "Nasal strips and external nasal dilators aren't effective for people with OSA." Oral appliances are form-fitting dental mouthpieces that help advance the position of your jaw, tongue and soft palate to keep your air passage open. 40% of snorers who have used oral appliances to alleviate snoring have reported grave discomfort. "Excessive salivation, dry mouth, jaw pain and facial discomfort are possible side effects from wearing these devices." As the name implies, a chin strap is a fabric-elastic strap wrapped tightly around the head to keep your jaw stable and prevent your mouth from opening during sleep. Chin straps are known to cause jaw pain, headaches, and cannot be used by people with dentures, caps, or crowns. 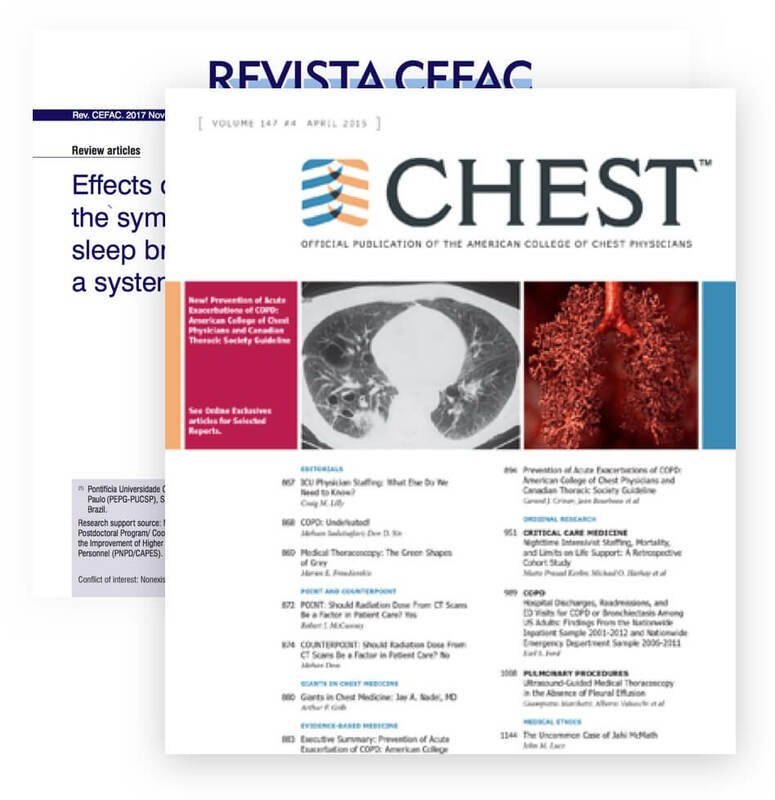 "A chinstrap alone is not an effective treatment for OSA. It does not improve sleep disordered breathing, even in mild OSA, nor does it improve the AHI [Apnea Hypopnea Index] in REM sleep or supine sleep. It is also ineffective in improving snoring." There are a number of invasive surgical procedures that are intended to open the upper airway and prevent airway narrowing during sleep. There is no guarantee of success with surgery, which is costly and time consuming, not to mention risky. "The effectiveness of these surgeries varies and the response can be challenging to predict." "Surgery may mask the development of sleep apnea." Over-the-counter nasal sprays, many which are steroid-based, are intended to relieve congestion and clear the upper airways, leading to decreased snoring. Long-term use of nasal sprays can be dangerous and counter-productive, and may in fact create greater congestion, leading to heavier snoring. "There is no significant objective or subjective snoring improvement in the anti-snoring aids [including nasal sprays] compared with the use of no aid." Homeopathic remedies for snoring are largely untested and medically controversial. They include homeopathic tablets and sprays. "Most of the [homeopathic] products haven't been proven effective in clinical trials." Compare major features of the most popular snoring products on the market. I finished your program 3 weeks ago and never would have believed this is possible! Comprehensive anti-snoring exercise video library. All of our videos are produced with clarity and simplicity in mind. You will memorize and understand how to perform the exercises quickly and efficiently. 8-week anti-snoring exercise program calendar. Our calendar makes sure you know exactly when you need to perform which routine in order to get maximum results. Seeing your improvements clearly will push you to continue the program until you’ve reached your goal. Lifetime access to all future upgrades. Get free access to any future upgrades and new features. 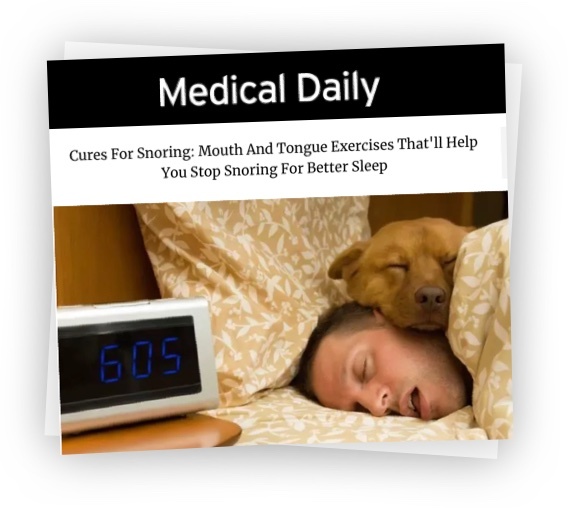 You can cure your snoring with this program, my husband did! My husband has been snoring for the past 17 years. After trying every contraption under the sun we finally succumbed to the fact that there may be no choice but to opt for surgery. Neither of us wanted to risk such a procedure but we had really reached hopelessness. Prior to us pulling the trigger on surgery a co-worker of mine told me about your program after stumbling upon it online. We quickly purchased the program and wished for the best. My husband stuck to the program religiously and by the end of the second week, his snoring was reduced to a mere barely audible whisper. Simply amazing! 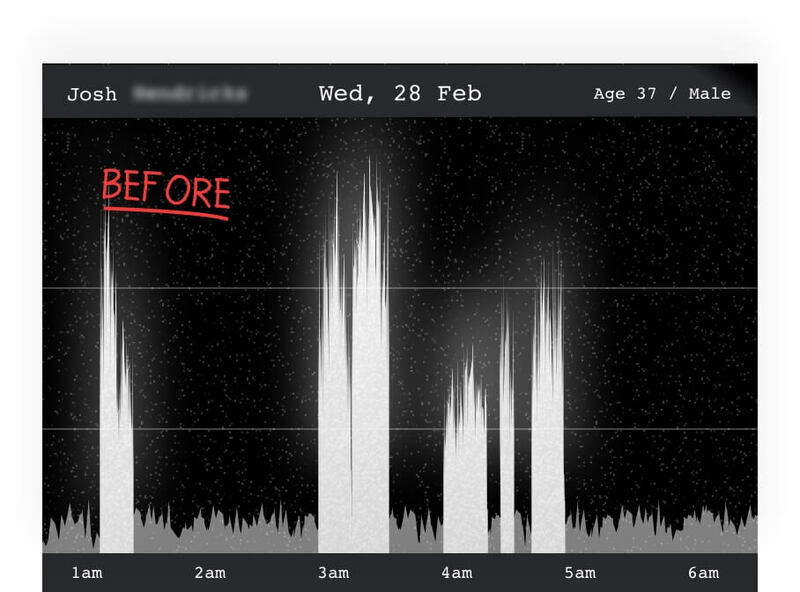 My Snoring is decreasing by the day! 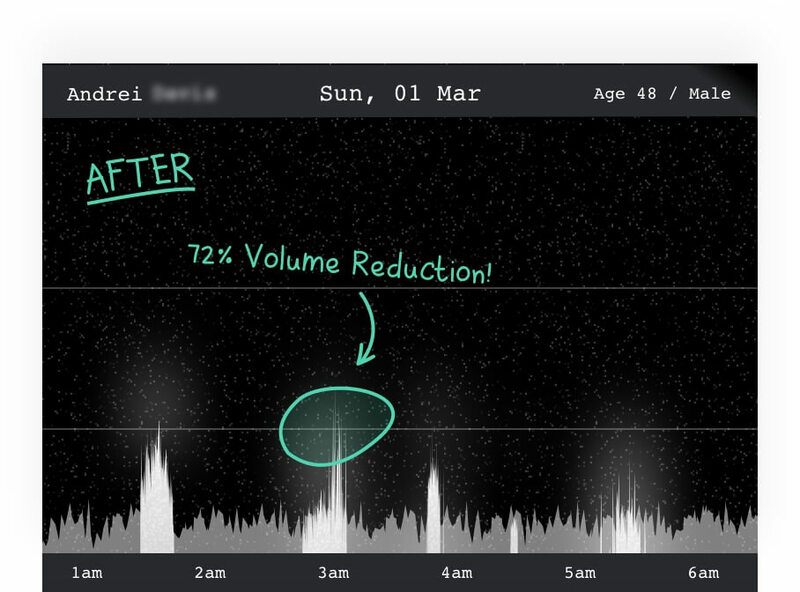 Since starting the Optimum Sleep Protocol 4 weeks ago my snoring volume has drastically been reduced to a point where it no longer wakes up my wife at night! I am halfway through your program and could not be happier. You guys are absolute lifesavers (or should I say relationship savers!) – your program saved my marriage. Thank you so much. Just wanted to write in and let you know that your program is definitely working for me. 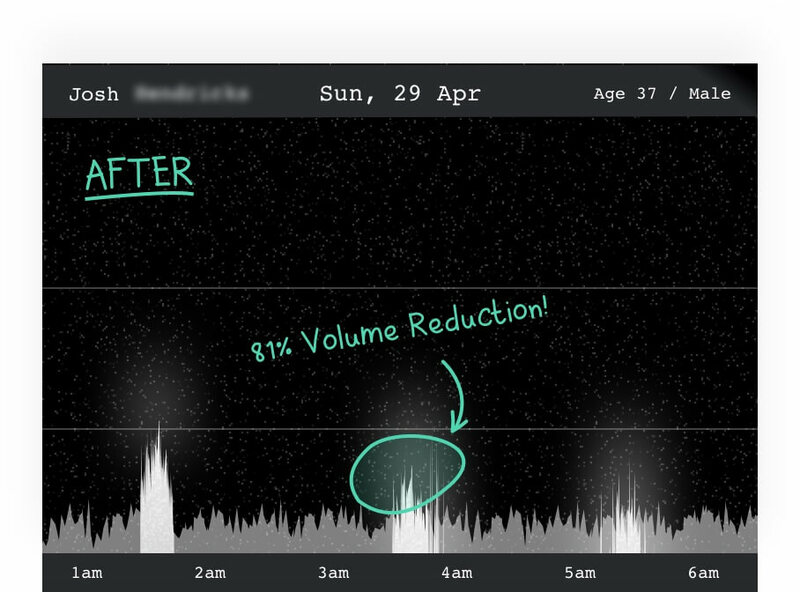 I’m in the third week and already feeling a significant reduction in my snoring volume. I have been a very heavy snorer for as long as I can remember and tried pretty much every other product on the market. Your program is actually the only solution that has ever worked for me and the fact that I don’t need to wear anything around my head or in my mouth makes it so much better. Amazing job, thank you so much. We went back to sleeping in the same room after just 5 weeks! My husband and I haven't slept in the same room for 3 years. His snoring was so loud it was simply unbearable. I convinced him to try your program 8 months ago during your trials before you launched to the general public. We went back to sleeping in the same room after just 5 weeks. He barely snores now and we are 8 months out from purchasing your program! I am truly grateful and wanted to congratulate you on an amazing product. I have since recommended the OSP to 3 friends. As far as I’m concerned this is a mircale. I’ve been snoring heavy since college. My snoring has been the bane of my existence for years now. It has cost me relationships, caused me stress and angusih and is something i thought i would have to live with forever, i even seriously contemplated getting surgery. I ran into one of your ads online and at first thought this wouldn’t really work, just like all the other products i’ve tried. After reading a bit about it and seeing it was proven through clinical studies i decided to give it a try. I purchased the optimum sleep protocol 3 months ago, today my snoring levels are so low that i don’t even consider it snoring anymore. I actually started feeling the results just 2 weeks into your program and stuck withit for the whole 8 weeks. Don’t know what to say, as far as I’m concerned it’s a miracle! Inever thought my snoring would be cured. This product is by far a life saver! I was diagnosed with sleep apnea several months ago and was told it was likely I would need to use a CPAP every night to bed. I could not imagine having to wear that awful mask on my face to go to bed every night.. the thought of it was weighing so heavily on me. I saw one of your ads and decided to give it a shot, i figured that even if there was just a small chance your program works it was worth the try if it could prevent me rom having to go the CPAP route. I could not believe the results i was seeing just two weeks into the program. 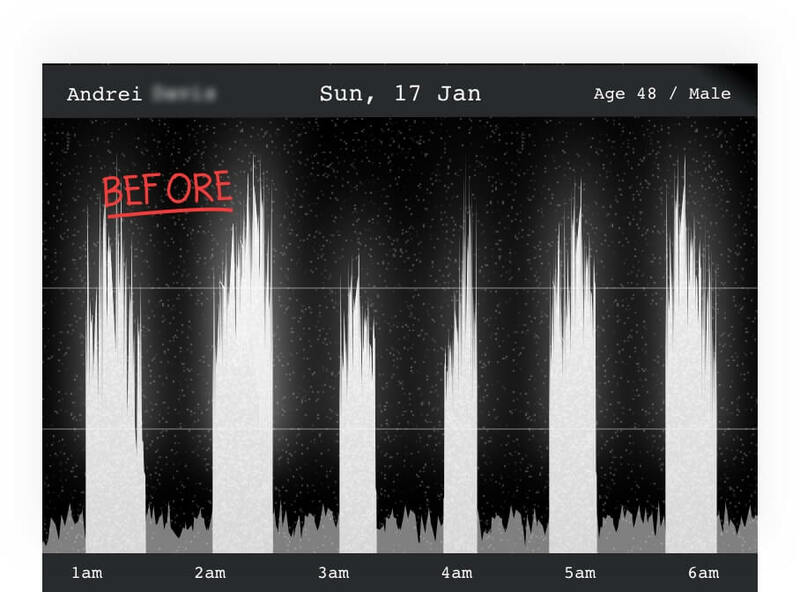 My husband was in shock at how little i was snoring and the aleep apnea episodes were drastically reducing as well. I never had to wear a CPAP thanks to your program. My sleep apnea was getting unbearable and is now non existent! I have been suffering from sleep apnea and snoring for a long time now. My wife and i were completely hopeless as to what to do. I feel like i have tied every anti snoring device ever created and none worked for me. My sleep apnea was getting worse and my doctor prescribed me a CPAP machine. I felt like my world was crumbeling down on me. There was no way in hell i was going to go to sleep every night with a CPAP. My wife found you online and without thinking twice i bought the program and crossed my fingers. 2 weeks into the program my wife was telling me that my snoring was getting better and my sleep apnea episodes were reducing as well. 4 weeks in the improvement was even greater. 6 weeks in i felt like was cured but thought of the cpap scared me into continuing the whole 8 weeks. 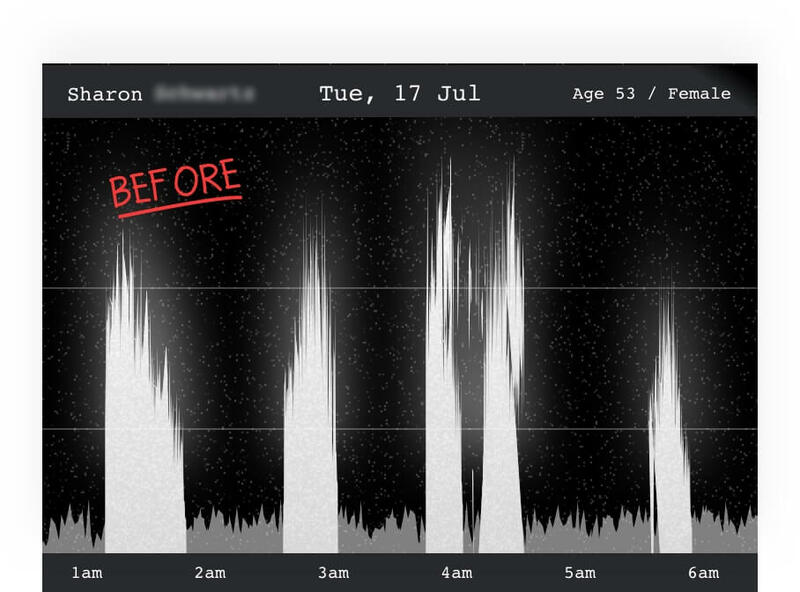 I barely snore these days if at all and my sleep apnea as close to disappeared. I never had to wear the CPAP! 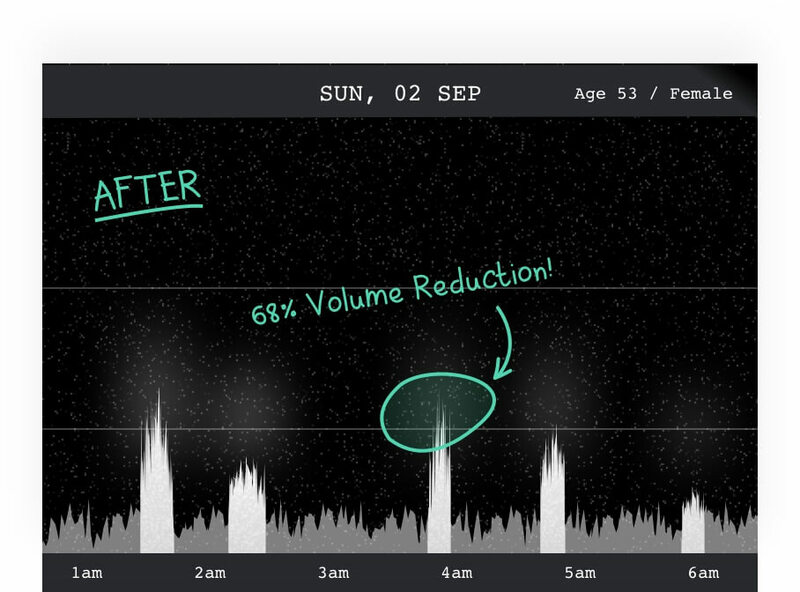 Thank you so much, the optimum sleep protocol is pure magic! Words can’t describe what your program has done for me and my wife. The optimum sleep protocol has truly chnaged our lives. We were sleeping in different rooms for 8 months. My snoring was getting so loud my wife not only slept in a different room but a different floor! I couldn’t believe this was happening to us, our relationship was great but since my awful snoring started it quickly detiriorated. It was rough.. i even thought i’d need surgery which was really scary. My mother in law as the one that found your program online and sent me the link. I completed the full 8 weeks and my snoring volume was reduced so drastically that my wife and i started sleeping in the same room again. What a feeling. Thanks so much for creating this program. Amazing program and amazing customer service! Hi guys, just wanted to let you know that i completed the 8 weeks and my snoring has been reduced by 74% from when i started your program . I can’t say my snoring was at the levels of alot of people i hear about but it was certainly at a point where it was bothering my wife. I also wanted to say that the customer service i experience through out the program was exeptional! I had a couple of questions on two different occasions and i received a detailed reply within 5 minites of hitting send. Customer service like that is hard to come by these days! Thanks for a wonderful program and exceptional customer service! Cure your snoring with our easy-to-follow integrated anti-snoring exercise program for your mouth, tongue, jaw, and throat. Got a question? Chances are that you’re not alone. Whenever you're ready! There's no set start date here. It's all based on your schedule! The moment you decide that it’s time to put an end to your snoring and sleep apnea, you can purchase the program and begin. Is this a DVD? A computer file? Do I need to download it? All you need is WiFi or a direct internet connection - no downloads or DVDs required! All content streams directly to your device. You get instant access once you sign up! Do I need to wait for anything in the mail? No, instant access begins upon purchase. Absolutely not, all you need is an internet connection. The program is 8 weeks long but you will see noticable results starting from the first week! 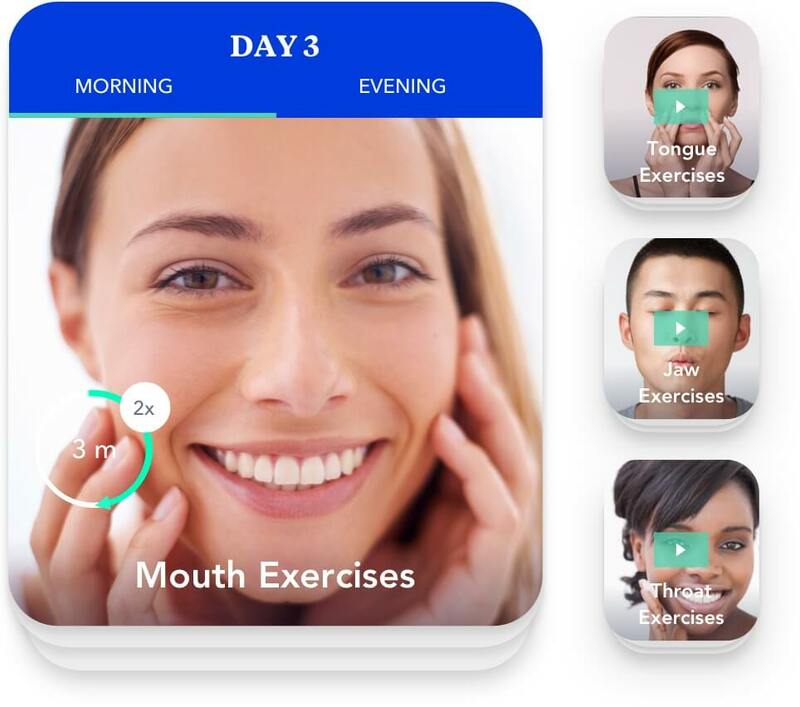 Over the course of 8 weeks, you will learn a variety of anti-snoring facial exercises that will keep things challenging, fun and most importantly, ultra effective for drastically reducing and even curing your snoring and sleep apnea. Can I access the program on my iPad, iPhone, Android? Yes. 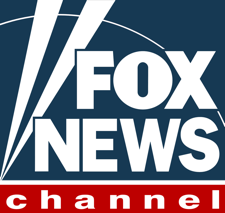 All of our content is cross-platform mobile compatible so you can access the program on all of your mobile devices. Do I need to devote a lot of my time to the program? I'm quite busy. Our program was built specifically for busy people with a lot going on in their lives. All of our exercises are under 20 minutes and can be done right at home, at work, in the car, or anywhere else. "In and out" is how we like to do it! 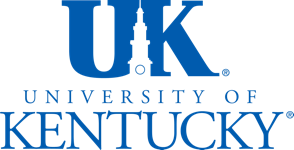 It is a primary focus of the program. The Optimal Sleep Protocol is designed and structured so you start feeling a significant reduction in your snoring levels within 2 weeks. This of course greatly depends on how strictly you follow our program. Is the Optimal Sleep Protocol for men or women? Our program is designed to fit the needs and achieve optimal results for both men and women who are trying to cure their snoring and sleep apnea. What if the exercises are too difficult for me? The Optimum Sleep Protocol is designed to gradually increase in difficulty as you progress through the program. To date, no one has claimed they exercises were too difficult for them. What kind of service can I expect to get? We take great pride in providing top-notch customer service to all of our clients. For any question you have, simply write to us at [email protected] and we will get back to you in a matter of a couple of hours, often much less than that! What happens if I am not satisfied with the program? 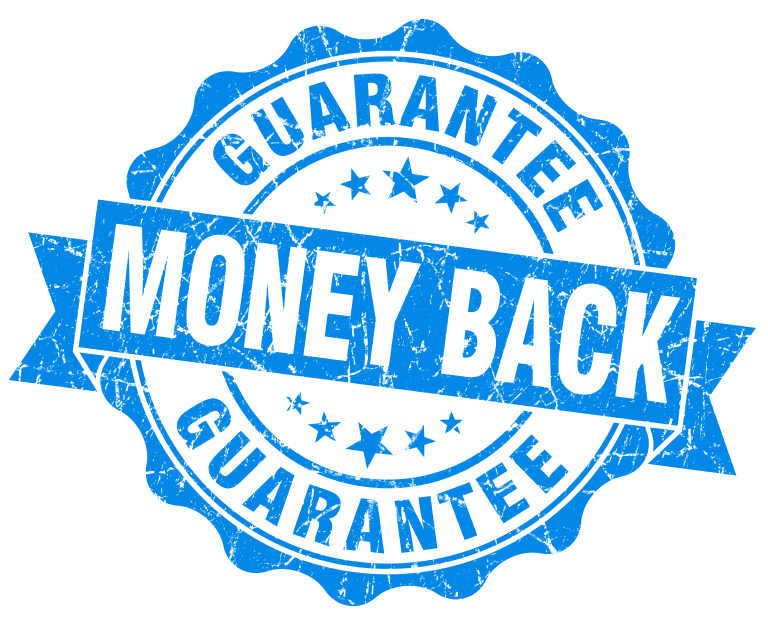 We are so sure that you will be more than satisfied with the results you get with the Optimum Sleep Protocol that we offer a “no questions asked” 60-day money back guarantee. If you are unhappy for any reason, simply email us with “refund request” as the subject of the email and your refund will be processed within 48 hours. It’s as easy as that. Will I get re-billed on a recurring basis or is this a one-time payment? You will not get re-billed. This is a one-time payment. Is it safe to order online from you? Absolutely. We use “Stripe” as our payment processor. Stripe is one of the leading payment processors online today handling billions of dollars of transactions every year. In fact, we never have access to your payment information, it goes directly through Stripe. It’s About Time You Stopped Snoring. ©2018 All Rights Reserved. OptimumSleep.co. Solve the root cause of your snoring. Secure your trial before it ends! Your info is private and secure.